an agile framework to radically think and create desirable futures. Future Modeling is an active training process uncovering personal hidden assumptions, while encouraging creativity with bold statements for possible and desirable futures. The methodology supports conscious decision making in teams and provides concrete options for action, which enables the development of future proof services and strategies. The combination of long term thinking and agile acting ensures effective implementation into current innovation processes and prototyping. 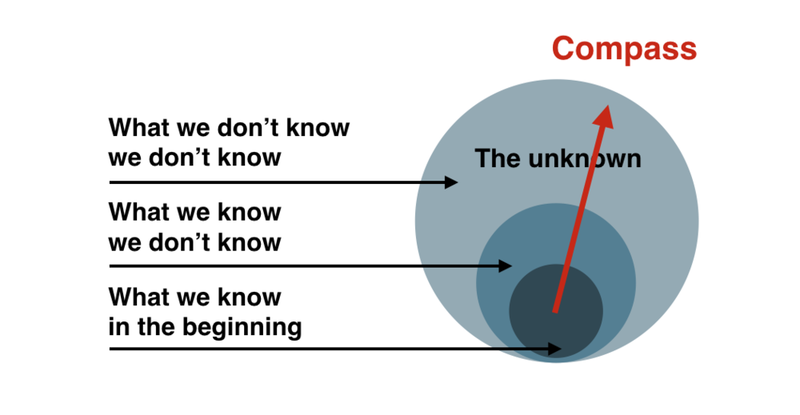 Questioning the old paradigm of knowing everything, managers nowadays need to solve problems in complex and totally unknown territories. KNOWEAUX helps companies and organizations to define a compass to navigate and follow the defined long term visions in times of radical change. 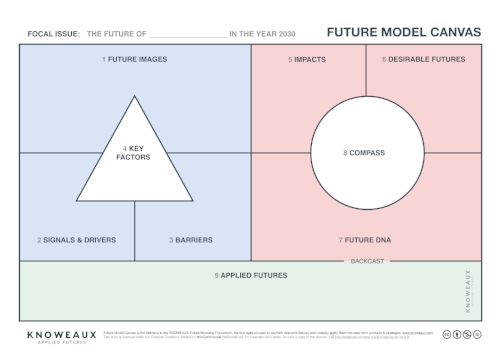 In contrast to traditional strategy and innovation processes, Future Modeling starts with proactive visions of the future. Subsequently, these visions undergo a systematic Future DNA Sequencing and serve as base for near term product development and strategic decisions. Companies are facing a critical gap between established innovation processes and future strategies. Long term scenarios - if existing at all - are not adequately integrated into current product developments. Future Modeling closes the gap by implanting Future DNA into near term services and strategies. The 9 step process is based on scientific methods and is applicable from 1.5-day Future Modeling workshops to company wide programs. *Creative Commons License The Future Model Canvas is licensed under the Creative Commons Attribution-NonCommercial-NoDerivatives 4.0 International License. To view a copy of this license, visit http://creativecommons.org/licenses/by-nc-nd/4.0/.